I made paella Saturday a few weeks ago! Or something sort of like it. ^_^ It began a week previously, with the half Peking duck I picked up for quarter the usual price - I boiled the rest down for stock, which turned out remarkably tasty. Too nice for just soup, I felt, and the notion of risotto wasn't exciting me. And then the idea happened upon me: paella. =:D I already had chicken in the freezer, and some tiger prawns in need of using up, plus most of the herbs and such - but that still left a few bits I needed to buy, like chorizo (not pre-sliced), and ideally, some authentic bomba rice, the traditional Spanish varietal that manages to absorb around 3x its volume in liquid, rather than the more usual 2x. Toward the end, I added a bag of tiger prawns, which I'd previously defrosted and marinated in lemon juice and oyster sauce, to be sure they wouldn't overcook, and then turned up the heat, to deliberately scald the bottom, as is the tradition. ^_^ Then, a few minutes' resting, and serving. Ahhh, yes. Okay, I won't be putting any Spanish chefs out of business, but it was very tasty indeed. ^_^ I'll certainly try some more variants in the future, emboldened by the way that bomba rice indeed doesn't ever go starchy - I'm not that comfortable with getting rice spot on, so having an essentially foolproof rice by my side definitely helps. That, coupled with a very pleasant Cabernet Sauvignon/Merlot from Australia, made for quite a pleasant Saturday night, followed on with Now You See Me. A fascinating site, via lovelyangel: "Introvert, Dear", which bills itself as being "for introverts and highly sensitive people". Easily worth a look: I Illustrate Scientists' Failures, including moments like "staring through my binoculars to count invasive parakeets roost @ NATO headquarters. Getting arrested by security team" and "baboons stole our last roll of toilet paper and used it to decorate a very very high tree". Does anyone have experience with ceramic kitchen knives? I'm giving consideration to picking up one or two, but first-hand experience would count for a lot, versus randomness on the web. Are there any brands to avoid, or things to look out for, good or bad? Need something beautiful in your life? How about the Northern Lights in Iceland, shot by a camera on a drone. A few weeks ago saw a rather fun little evening of science, courtesy of Dr Kat Arney, explaining (insofar as one can in but an hour or so!) just how genes work - not nearly as simple a topic as most headline writers would have you believe: the magic isn't really in the genes, so much as the specific timing of their expression. The questions afterwards added, too - I'm pleased I reminded the roomie to stay put for that. =:) If you get the opportunity to hear her give a talk, go for it - and be prepared to buy her book - Herding Hemingway's Cats - which, looking at the roomie's copy, is indeed well worth picking up. Think you've got web design chops? Have a go at the 10K challenge - as long as your page(s) come in under 10K, with additional resources permissible later, you're fine. The winner gets a $4k Visa and other goodies, with three runners up (design, technical, people's choice) getting a $2k Visa and the goodies. Entries must be in by Sep 30 2016, and everyone can submit up to three projects. The rules don't appear to mention any geographical restrictions. 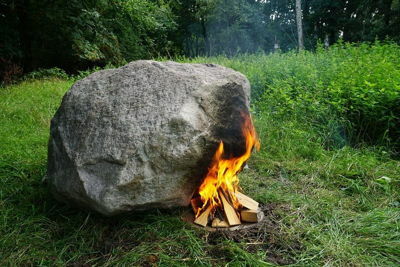 This boulder is also a WiFi access point, powered by fire. Well, that was a minor relief - the iPhone had begun to exhibit difficulties charging, with both the cable I've always used, and the iPad's. I was beginning to wonder if there might be some weird fault, which wouldn't be a lot of fun, but thought the cable might be duff - but, no, the iPad's fine with either. I recalled having similar trouble a year or so back, which turned out to be just accumulated lint, so I tried folding a corner of a sheet of paper into a thin tool to try getting anything out, but couldn't seem to retrieve anything, leaving me without much of a solution. Finally, my meagre bunny brain wondered it a slender wiretie might do the trick, being thin enough, but also offering a definite point at the end - and lo, many tiny fluff nuggets were excavated, and it's merrily slurping down on electrons once more. So, whilst I still don't like the idea of wireless charging much, given the losses involved (though, there do seem to be ways of improving - the Wiki page indicates one system's capable of 86%), I'll admit there's at least something of a use case. Game of the week has to be The Inner World, a release from 2013 which I'd completely missed. It's as well written as you'd hope from a good point & click adventure, with appropriately professional voice acting, and all in a nicely surreal (though not entirely unfamiliar) world. I only found out about it as its sequel is apparently on its way for early in 2017. ^_^ Anyway, here's the original's trailer - it gives a reasonable impression of what's in store, if perhaps a bit light on the (dry) humor that courses through it. Not much to report on the rabbiteering front lately, I'm afraid - the weather and availability have conspired to make for only a couple opportunities in the past week or so, and frustratingly, on both, they've been more comfortable with staying indoors, to the point of only taking two shots on all three days. ^_^; I did take the time to check out the other spots along the circuit that I've sometimes had good fortune with, though - down in the dip by the footpath, there does seem to be some activity, with two buns wanting to get out of sight as I approached. Further on, the lower priority spot (for want of better access - there's long been an active warren by the footpath, but no useful visibility for photography) is currently out of reach, with shrub and nettle growth now obscuring the view entirely. 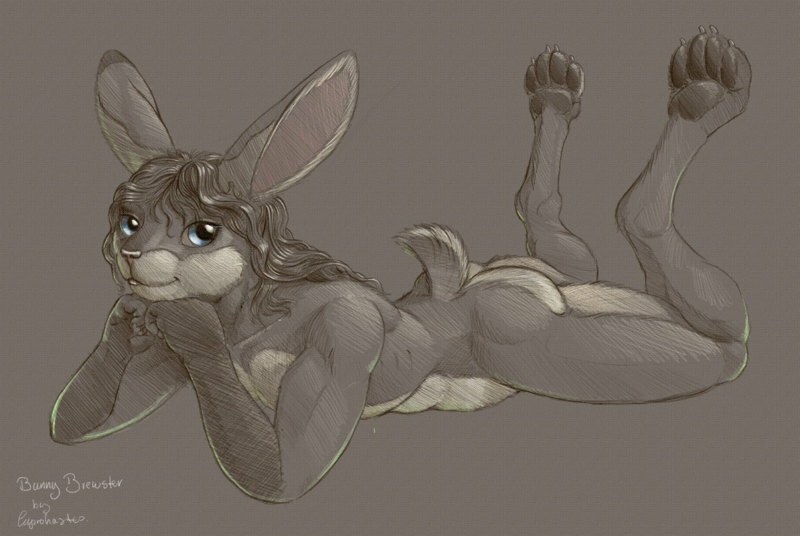 I'd hoped the old spot where I took Momentary might perhaps have come back to life, but there wasn't any immediate sign of bunnitude there. Similarly old school (relatively), we have Biker Mice: Mars Attack!, apparently a prequel to the TV show. "The stinkin' fish-faced Plutarkians have launched a devastating attack on Mars. They have won the war and begun extracting all of the planet's resources to send back to Plutark, but the resistance continues. Take control of the Martian Freedom Fighters in a turn-based strategy battle against the Plutarkian armies and their mercenaries. With your favorite characters from the classic 90s TV series 'Biker Mice from Mars' and gameplay inspired by another 90s classic 'Advance Wars', this game was built by fans for fans. 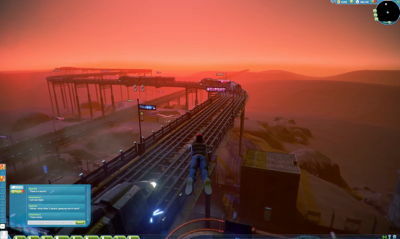 Play as commanders Modo, Throttle and Vinnie." What it's like to be detained at Heathrow, having been invited to the UK by the organisers of a conference. Everyone's heard of the "we only use 10% of our brains" myth - but, on trying to find out where that yarn's origins lay, I was rather surprised to find there isn't a definitely known source, though it's been circulating for around a century now. This is technically an ad, but, it's from Spike Jonze. It's quite brilliant. ^_^ KENZO World, to an original score by Sam Spiegel. If you can dig superb choreography, this is one to watch. Last Saturday's viewing was more single-minded, but far-reaching: all three episodes of A Cabbie Abroad, which pitches a London taxi driver into the reality of driving in some very different locales - Phnom Penh, Iqaluit (capital of Nunavut), and Fiji. There are no punches pulled in showing just how threadbare life can be in Phnom Penh and Suva, or the extent of the cultural upheaval the Inuit have had to try to come to terms with. What would a geologist's perspective be, then? The Inner World looks really interesting, thanks! I'm trying to work out how to buy it, but I can only find the OS X version priced at £12, which seems wrong when there's an Android version costing £2.29. Is that a normal price discrepancy? Weirdly, that does seem fairly commonplace, for no reason I can quite fathom. Not that I'm complaining, of course - the iOS version is similarly priced, and it's entirely the same game as its desktop kin, no IAPs. I suppose it's simply the result of many folk thinking mobile games have to be next to free, as all the others are. I do wish the next part were coming sooner, but still, before then, there's also the final part of Star Billions (a curious title with sort of Animal Crossing sensibilities, but a storyline that's quite nicely convoluted - you're advising four AIs aboard a spaceship, in a tale of trying to find where humanity's gone, and what happened), the next and/or final part of Agent A: A Puzzle in Disguise, another p&c adventure, this time with 1960s animation stylings, like a less serious Bond. Sadly, the concluding part of The Journey Down won't be out until early next year as well; there, the style is all about African tribal masks forming everyone's faces, rather effectively. It wasn't so much about being uncertain of things, more being annoyed by having my view obstructed, if you see what I mean. It's like “hey, I was looking at that!” Perhaps it'd be better on a tablet rather than a smartphone. 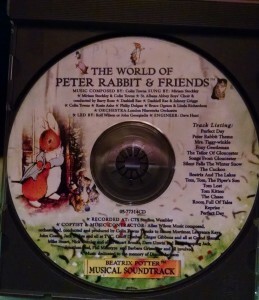 Long ago and far away, my mom bought the kids a Peter Rabbit and Friends vhs tape (only two episodes, I believe), and it came with the series soundtrack on a CD! I still listen to these lovely, lilting songs and melodies. Netflix or Amazon had the series for a while, if memory serves me. 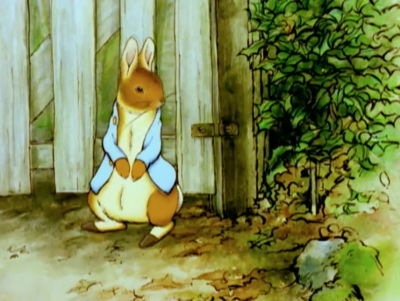 I'm glad your rabbits are re-populating. Such a diverse little species! We have three out front every morning and night now, and I believe two may be siblings who chose not to follow local biologists' "rules for rabbits" that the cottontails are solitary and keep to their territories. The "Scientists' Failures" blog is hilarious; many thanks for bringing it to my attention! 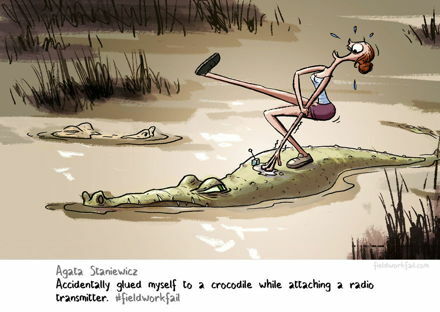 I was already cracking up at your "glued myself to the crocodile" image, and quite a few of the others at that site cracked me up as well, in particular "Mr. Flappy" and "I swallowed the fossil".